For the historic site, see Wilson's Creek National Battlefield. The Battle of Wilson's Creek, also known as the Battle of Oak Hills, was the first major battle of the Trans-Mississippi Theater of the American Civil War. Fought on August 10, 1861, near Springfield, Missouri, between Federal forces and the Missouri State Guard, it is sometimes called the "Bull Run of the West." Battle of Wilson's Creek by Kurz and Allison. At the beginning of the war, Missouri maintained an officially neutral status. However, its governor, Claiborne Fox Jackson, began to work to bring Missouri out of the Union by purchasing arms from and fighting alongside Confederate troops. The two sides repeatedly skirmished, most notably in the Camp Jackson affair, the Battle of Boonville, and the Battle of Carthage. Jackson's support for secession resulted in his removal by a constitutional convention in July. Jackson refused to accept the maneuver as valid, and continued to act as governor. In early August 1861, Confederates under the command of Brig. Gen. Benjamin McCulloch and Missouri State Guard troops under the command of Maj. Gen. Sterling Price approached Union Brig. Gen. Nathaniel Lyon's Army of the West, which was camped at Springfield. On August 9, both sides formulated plans to attack the other. At about 5:00 a.m. on August 10, Lyon, in two columns commanded by himself and Col. Franz Sigel, attacked the Confederates on Wilson's Creek about 12 miles (19 km) southwest of Springfield. Confederate cavalry received the first blow and retreated from the high ground, later referred to as "Bloody Hill," and infantry soon rushed up to stabilize their positions. The Confederates attacked the Union forces three times during the day, but failed to break through. When Lyon was killed during the battle and General Thomas William Sweeny wounded, Major Samuel D. Sturgis assumed command of the Union forces. Meanwhile, the Confederates routed Sigel's column south of Skegg's Branch. Following the third Confederate attack, which ended at 11:00 a.m., the Union withdrew. When Sturgis realized that his men were exhausted and lacking ammunition, he ordered a retreat to Springfield. The Confederates were too disorganized and ill-equipped to pursue the retreating Federal forces. The Confederate victory buoyed Southern sympathizers in Missouri and served as a springboard for a bold thrust north that carried Sterling Price and his Missouri State Guard as far as Lexington. In late October, a convention organized by Jackson met in Neosho and passed out an ordinance of secession. Although the state remained in the Union for the remainder of the war, the Battle of Wilson's Creek effectively gave the Confederates control of southwestern Missouri. Today, the National Park Service operates Wilson's Creek National Battlefield on the site of the original conflict. At the beginning of the American Civil War, Missouri declared that it would be an "armed neutral" in the conflict, and not send materials or men to either side. On April 20, 1861, a secessionist mob seized the Liberty Arsenal, increasing Union concerns in the state. The neutrality was put to a major test on May 10, 1861, in what became known as the Camp Jackson Affair. Governor Claiborne F. Jackson had called out the Missouri Volunteer Militia (MVM) to drill on the edge of St. Louis in Lindell Grove. The governor had clandestinely obtained artillery from the Confederacy and smuggled it into the militia encampment – referred to as "Camp Jackson". Capt. Nathaniel Lyon was aware of this shipment and was concerned the militia would move on the St. Louis Arsenal. Thomas W. Sweeny was put in command of the arsenal's defense, and Lyon surrounded the militia camp with Union troops and home guards, forcing the surrender of the militia. When he marched the prisoners through the streets to the arsenal, some angry members of the crowd began to press against the procession. Taunts and jostling eventually led to gunfire and many deaths, mostly civilians but also several soldiers and members of the militia. This means war. In an hour one of my officers will call for you and conduct you out of my lines. Lyon sent a force under Sweeney to Springfield while his own forces quickly captured the capital and pursued Jackson, Price, and the now-exiled state government across Missouri. Skirmishes followed, including the Battle of Boonville on June 17 and the Battle of Carthage on July 5. In light of the crisis, the delegates of the Missouri Constitutional Convention that had rejected secession in February reconvened. On July 27, the convention declared the governor's office vacant and selected Hamilton Rowan Gamble to be the new provisional governor. By July 13, 1861, Lyon's army of approximately 6,000 men was encamped at Springfield. His force was composed of the 1st, 2nd, 3rd, and 5th Missouri infantry, the 1st Iowa Infantry, the 1st Kansas and 2nd Kansas (infantry, several companies of regular army infantry and cavalry, and three batteries of artillery). He divided the units into four brigades commanded by Major Samuel D. Sturgis, Colonel Franz Sigel, Lieutenant Colonel George Andrews, and Colonel George Dietzler. By the end of July 1861, the Missouri State Guard was camped about 75 mi (121 km) southwest of Springfield and had been reinforced by Confederate Brigadier General Benjamin McCulloch and Arkansas state militia Brigadier General N. Bart Pearce, making the mixed Missouri/Arkansas/Confederate force over 12,000 strong. They developed plans to attack Springfield, but Lyon marched out of the city on August 1 in an attempt to surprise the Southern forces. The armies' vanguards skirmished at Dug Springs, Missouri on August 2. The Union force emerged as the victor, but Lyon learned he was outnumbered more than two-to-one and retreated back to Springfield. McCulloch, now in command of the Missourian army, gave chase. By August 6, his force was encamped at Wilson's Creek, 10 miles (16 km) southwest of the city. Price favored an immediate attack on Springfield but McCulloch, doubtful about the quality of the Missouri State Guard, preferred to remain in place. After Price threatened to launch an attack without his support, McCulloch agreed to an attack at dawn on the 10th but when a rainstorm started during the evening of the ninth, he cancelled his plans and ordered his troops back to camp. Outnumbered, Lyon planned to withdraw northeast to Rolla to reinforce and resupply, but not before launching a surprise attack on the Missourian camp to delay pursuit. Sigel proposed striking McCullough in a pincer movement, which would split the already outnumbered Union force; he planned to lead 1,200 men in a flanking maneuver while the main body under Lyon struck from the north. Lyon concurred, and in accord with Sigel's plan, the Union army marched out of Springfield on the rainy night of August 9, 1861, leaving about 1,000 men to protect supplies and cover the retreat. At first light on the morning of August 10, the Union began a surprise attack on the opposing forces. Lyon's force overran the enemy camps and took the high ground at the crest of a ridge, which would become known as "Bloody Hill". Early Union hopes for a rout were dashed, however, when the artillery of the Pulaski Arkansas Battery unlimbered and checked the advance, which gave Price's infantry time and cover to organize lines on the south slope of the hill. Lyon organized a line on the southern slope of Bloody Hill, from which he launched an unsuccessful counterattack. Price launched a series of frontal and flank attacks but was also unsuccessful; a shortage of ammunition in the Confederate army was a factor in the Confederate defeats. The two Union forces lost contact with each other, with no means of communicating with or supporting each other if anything went wrong. Sigel's attack was successful at first; the brigade arrived in the Confederate rear soon after dawn. Artillery fire routed the Confederate cavalry units, which were encamped at the Sharp's farm. Sigel began a pursuit, but stopped along Skeeg's Branch. During the break, he failed to post skirmishers, leaving his left flank open for an attack. Meanwhile, McCulloch rallied several Confederate units, including the 3rd Louisiana Infantry and the 3rd Division from the Missouri State Guard, to lead a counterattack. Sigel's men mistook the 3rd Louisiana for the 1st Iowa Infantry (which also wore gray uniforms) and withheld their fire until the Confederates were nearly upon them. His flank was consequently devastated by the counterattack, and his brigade was routed, losing four cannons. Sigel and his men fled the field, leaving the force under Lyon, Sweeny, and Sturgis holding out alone. 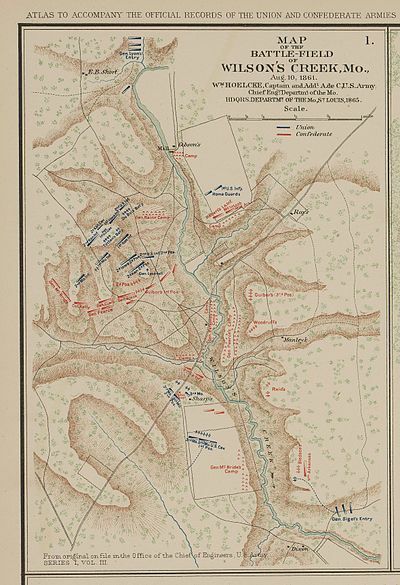 With the rout of Sigel's flank, the momentum of the battle shifted in the South's favor. Lyon was wounded twice, and his horse was killed during the fighting. He returned to Union lines on foot and commandeered a bay horse ridden by Maj. E.L. McElhaney of the Missouri Infantry. Lyon became the first Union general to be killed in the war; he was shot in the heart on Bloody Hill at about 9:30 a.m. while leading the 2nd Kansas Infantry in a countercharge. General Sweeny was shot in the leg, and Major Sturgis, as the highest ranking Regular Army officer, assumed command of the Union army. While still in a defensible position atop the hill, Union supplies were low and morale was worsening. By 11:00 a.m., the Union forces had already repulsed three separate Confederate charges. Ammunition and men were nearly exhausted, and Sturgis retreated rather than risk a fourth Confederate attack. Henry Clay Wood, in command of a company that helped cover the retreat, later received the Medal of Honor for the heroism he displayed in keeping his company organized and functioning as it left the battlefield. The casualties were about equal on both sides – around 1,317 Union and 1,230 Confederate/Missourian/Arkansan soldiers were either killed, wounded, or captured. Though the Confederate force won the field, they were unable to pursue the retreating Union forces to Rolla. Price wanted to start a pursuit of the Union force immediately, but McCulloch refused, worried about the quality of the Missouri State Guard and the length of his supply line back to Arkansas. With the victory, Price's Missouri Guard began an invasion of northern Missouri that culminated in the First Battle of Lexington on September 20, 1861. The Confederate and Arkansas forces withdrew from the state. After falling back to Springfield, Sturgis handed command of the army over to Sigel. At a council of war that evening, it was agreed that the Union army had to fall back to Rolla, beginning at 3 a.m. the next morning. However, Sigel failed to get his brigade ready at that time, forcing a delay of several hours. Along the retreat route, Sigel's men took several lengthy delays to prepare meals; this caused the other officers to force Sigel to turn command back over to Sturgis. On October 30, 1861, the Missourians under Price and Jackson formally joined the Confederate cause in Neosho, Missouri. A rump of the Missouri State Assembly meeting in Neosho passed the resolutions for Missouri secession and Jackson became (nominally) the Governor of Confederate Missouri (Jackson had never accepted his July removal from office by the State Convention). However, the secession action was never accepted by most of the population of Missouri, and the state remained in the Union throughout the war. What little control Price and Jackson did have was diminished by Confederate reverses during the Battles of Fredericktown on October 21 and the First Battle of Springfield on October 25. The Confederate state government was soon forced to leave the state. Although Price enjoyed some Missouri victories, notably the siege and capture of Lexington, he did not have the popular support to remain in the field, eventually retreating to northwest Arkansas. After 1861, he was commissioned as a Confederate Major General and led his forces in battles in Arkansas and Mississippi. While there were smaller incursions and skirmishes in Missouri, Price did not return to Missouri with a major force until 1864. Nevertheless, Missouri suffered extensive guerrilla warfare between Unionists and pro-Confederate bushwhackers such as Quantrill's Raiders and Bloody Bill Anderson throughout the war. By early 1862, Federal forces had effectively pushed Price out of Missouri. An army under Union general Samuel Ryan Curtis pursued Price into Arkansas, where General Earl Van Dorn assumed command of combined forces led by Price and McCulloch. Outnumbered, Curtis nonetheless defeated Van Dorn's Confederate Army of the West at the Battle of Pea Ridge on March 6–8, ending any attempt by a major Confederate force to occupy Missouri until Price's Raid in 1864. The Battle of Wilson's Creek was the first major battle fought west of the Mississippi River. The site of the battle in Missouri has been protected as Wilson's Creek National Battlefield. The National Park Service operates a visitor center featuring a museum, a 26-minute film, a nine-minute fiber optic battle map presentation, and a Civil War research library open to the public. Living history programs depicting soldier life, cavalry drills, musket firing, artillery demonstrations, period medicine, and period clothing are generally held on Sunday afternoons Memorial Day through Labor Day. With the exception of the vegetation and the addition of interpretive hiking trails and a self-guided auto tour route, the 1,750 acres (7.1 km2) battlefield has changed little from its historic setting, allowing visitors to experience the battlefield in nearly pristine condition. The home of the Ray family, which served as a Confederate field hospital during the battle, has been preserved and restored and is open periodically throughout the summer, with Park Service interpreters dressed in period clothing. In addition, the Civil War Trust (a division of the American Battlefield Trust) and its partners have acquired and preserved 272 acres (1.10 km2) of the Wilson's Creek battlefield. ^ a b Piston & Hatcher 2000, p. 338. ^ a b Piston & Hatcher 2000, p. 337. ^ Brooksher 1995, pp. 60–63. ^ Brooksher 1995, pp. 69–70. ^ Piston & Hatcher 2000, pp. 37–38, 81. ^ Ethier 2005, p. 45. ^ Brooksher 1995, p. 158. ^ Piston & Hatcher 2000, pp. 337–338. ^ a b Ethier 2005, p. 46. ^ Piston & Hatcher 2000, pp. 177–178. ^ Brooksher 1995, pp. 182–183. ^ Piston & Hatcher 2000, p. 234. ^ Piston & Hatcher 2000, p. 191. ^ Piston & Hatcher 2000, p. 252. ^ Brooksher 1995, pp. 213–214. ^ Ellis, William Arba (1911). Norwich University, 1819-1911; Her History, Her Graduates, Her Roll of Honor. 2. Montpelier, VT: Capital City Press. pp. 581–582. ^ Piston & Hatcher 2000, pp. 310–312. ^ Piston & Hatcher 2000, pp. 305–306. ^ Piston & Hatcher 2000, pp. 314–315. ^ Brooksher 1995, p. 235. ^ a b NPS 2012. Brooksher, William (1995). Bloody Hill: The Civil War Battle of Wilson's Creek. Brassey's. ISBN 9781574880182. OCLC 32393986. Ethier, Eric (December 2005). "A Mighty Mean-Fowt Fight". Civil War Times Illustrated. XLIV (5). ISSN 0009-8094. OCLC 1554811. Garrison-Finderup, Ivandelle Dalton (1997). Roots & Branches of Our Garrison Family Tree. Garrison Library. Moore, John C. (1899). "Missouri in the Civil War". Confederate Military History. IX. OCLC 25038789. "Wilson's Creek National Battlefield". National Park Service. April 6, 2012. Retrieved June 4, 2012. Piston, William Garrett; Hatcher, Richard (2000). Wilson's Creek: The Second Battle of the Civil War and the Men Who Fought It. University of North Carolina Press. ISBN 9780807825150. OCLC 41185008. Bearss, Edwin (1992). The Battle of Wilson's Creek (2nd ed.). Wilson's Creek National Battlefield Foundation. ISBN 978-0425053829. Long, E.B. ; Long, Barbara (1971). The Civil War Day by Day; An Almanac 1861–1865. Da Capo Press. Underwood, Robert; Buel, Clarence C. (1884). Battles and Leaders of the Civil War. New York: Century Co. Retrieved June 3, 2012.